The plovers are all typical 'ringed-type Charadrius plovers'. The first, and most widespread, is the Collared Plover Charadrius collaris. Found throughout Brazil and the region to the west of the Andes as far south as northern Argentina and in a small area of Chile, it can be readily encountered on beaches, mud flats, estuaries, and inland freshwater rivers and ponds. Collared Plover: May 2013, Brazil. The second plover is the Two-banded Plover Charadrius falklandicus a dapper looking bird that sticks to coastal habitats principally around the southern two-thirds of the cone of South America moving further north in the Austral winter and on the Falkland Islands, a fact that is given away somewhat by its scientific name. The last plover is the Puna Plover Charadrius alticola. Like the Andean Lapwing it is a bird of the high Andes in the central zone including northern Chile to central Peru, and western Bolivia to north-west Argentina. Closely related to the previous species it probably is a high altitude version of it showing a faint chestnut breast band in breeding plumage. It is just as at home next to salty as fresh water lakes and mountain grazing pastures with short grass. 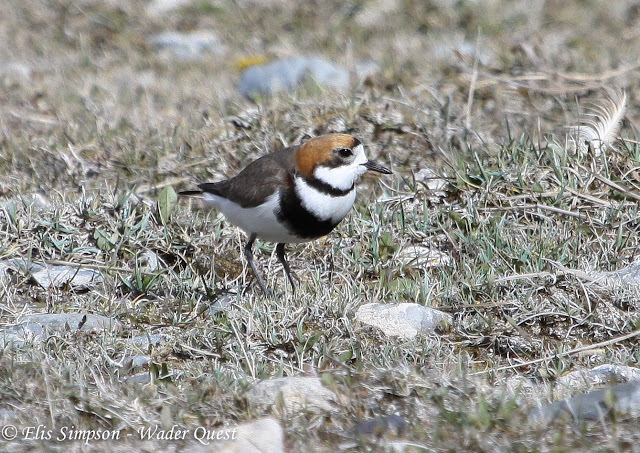 Puna Plover: November 2013, Chile. Part three next, the concluding part with dotterels and Diademed Sandpiper-Plover.